Export your MailChimp email template as HTML, then create an HTML proof for your reviewers to gather feedback. 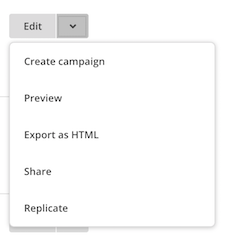 In MailChimp, click the dropdown next to edit and select Export as HTML. This will download the template as an HTML file to your computer’s downloads folder. Zip the index.html file, then drag and drop the zip folder on to the PageProof file dropper icon to create a proof.